The Federal Reserve’s (Fed’s) rate increase this week was widely expected, and focus is now on what’s next for 2018. We see the central bank delivering its projected three 0.25% rate increases in 2018—and pressing ahead with shrinking its balance sheet. A fourth rate hike could come if the Fed expects tax cuts to raise inflationary pressures. The Fed is likely to put some distance between itself and other major central banks with these further rate increases in 2018. 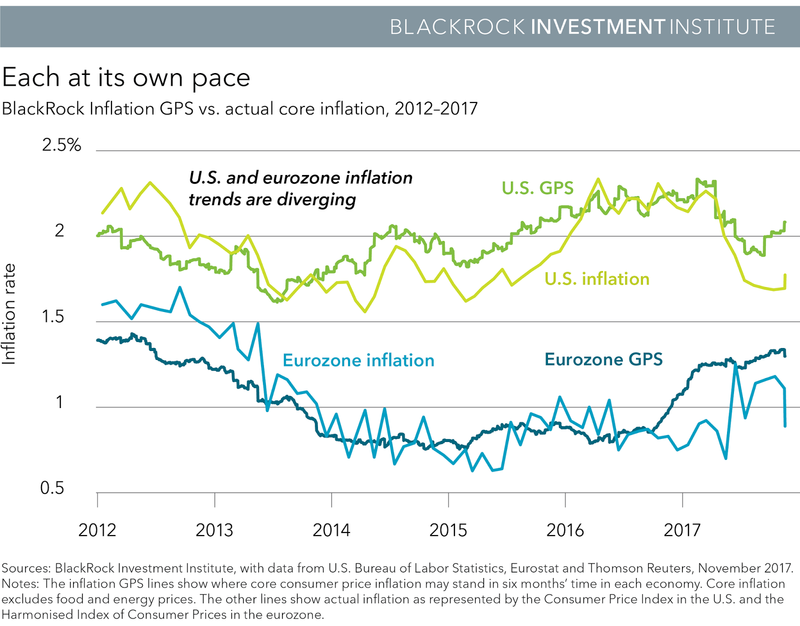 This monetary policy divergence comes as U.S. inflation appears poised to re-awaken, whereas price pressures elsewhere are minimal. This modest inflation comeback is just one of the three key investing themes we see shaping economies and markets in 2018, as we write in our new 2018 Global Investment Outlook. We see stable global growth with room to run. The eurozone is enjoying its fastest economic expansion since 2011. Emerging market (EM) growth looks self-sustaining, even if powerhouse China slows more than markets currently expect. The breadth of the global recovery has expanded: Manufacturing figures are up in about 80% of countries, a share that has steadily increased over the past year. And U.S. tax cuts could provide a decent dose of fiscal stimulus. Yes, the G7 output gap—the difference between actual output and economic potential—is shrinking as the U.S. economy has joined Germany, the UK and Canada in running near full capacity. See the Filling up chart below. 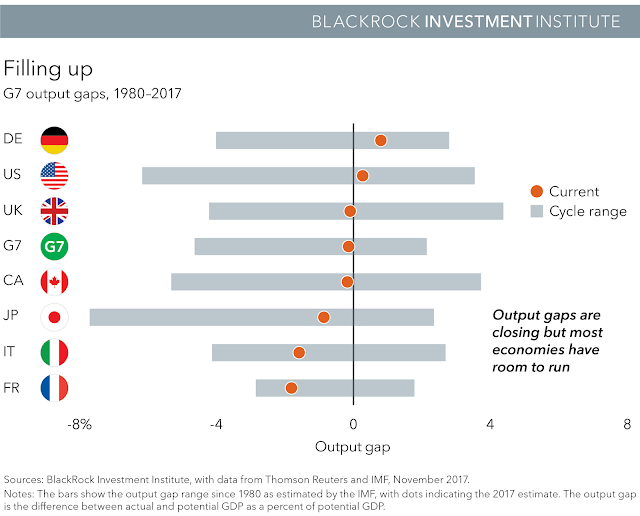 Yet when growth is only slightly above trend, economies can run beyond potential for a long time before peaking, our analysis shows. We believe the remaining time to this cycle’s peak is likely years. We do see less scope for upside growth surprises as consensus expectations have mostly caught up with our GPS for G7 economies over the past year. But we believe the above-trend level of growth should be positive for risk assets, and it’s helping companies deliver on earnings. 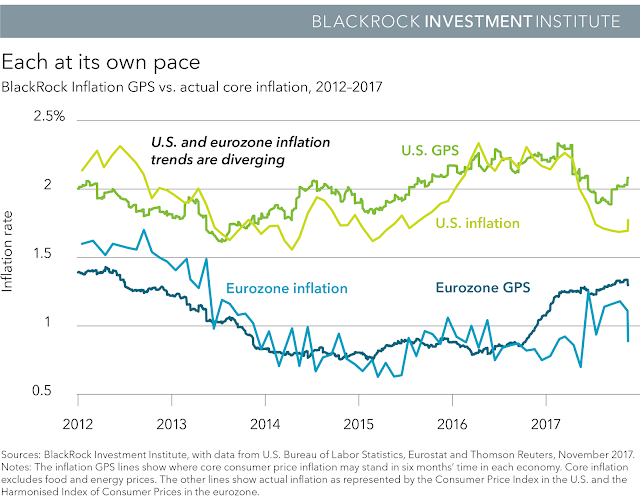 We see inflation making a modest comeback, led by the U.S. Our BlackRock Inflation GPS has long pointed to U.S. core inflation rising back to the 2% level, as shown in the Each at its own pace chart below. We see 2017’s surprising soft inflation patch as fleeting and expect markets to grow more confident in the inflation outlook. Why? Wages are grinding higher and one-off factors, notably an adjustment to how wireless data costs are measured, will wash out of inflation readings. As a result, we see higher U.S. yields ahead and prefer inflation-protected bonds over the nominal variety. We expect modest upside in eurozone prices but share the European Central Bank’s (ECB’s) outlook for inflation stuck below target at least through 2019. Spare capacity still abounds in the eurozone. We see similar trends in Japan. This is why we expect both the ECB and Bank of Japan to keep policy loose, as the Fed makes slow but steady progress in normalizing policy. Markets see short-term rates in Europe and Japan staying negative through 2019, but anticipatory anxiety around potential policy shifts could begin stoking bouts of volatility in 2018. Another takeaway: We expect monetary policy divergence to be an ongoing theme supporting the U.S. dollar. This year was a near-perfect one for risk assets, and 2017 will be a hard act to follow. The road ahead looks more challenging. Why? Asset valuations have risen across the board, market volatility has stayed very low and many perceived risks have not materialized. This makes markets more vulnerable to temporary selloffs sparked by the bubbling over of risks, including those related to rising trade tensions and North Korea’s missile launches. The risk premia on all financial assets has declined. 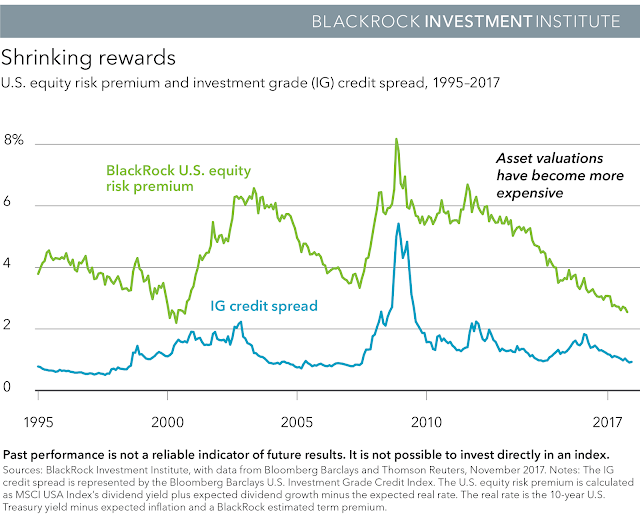 Our measure of the U.S. equity risk premium—one gauge of equities’ expected return over government debt—has fallen since the global financial crisis. See the Shrinking rewards chart below. We believe overall market returns will be more muted as a result, making selectivity key. Economic expansion supports both equities and credit, but we prefer to take risk in equities, particularly non-U.S. stocks. 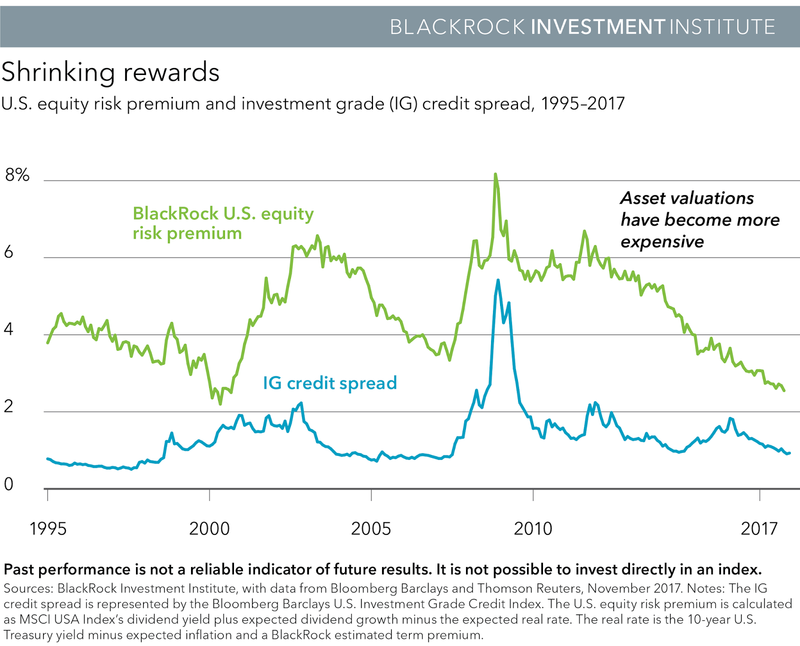 We see limited upside to credit, and believe structurally low interest rates mean equity multiples can stay higher than in the past. The bottom line: We believe investors will still be compensated for taking risk in 2018—but receive lower rewards. Read more in our latest outlook.